Renowned TV satirist Bassem Youssef arrived at Egypt’s High Court on Sunday morning in response to an arrest warrant submitted by the country’s top prosecutor. 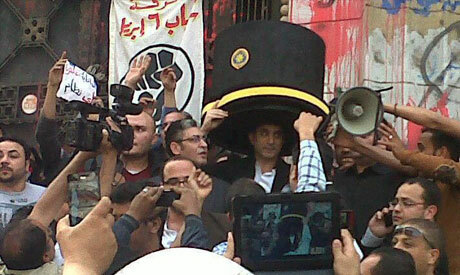 Youssef turned up at the court wearing an outsized version of the hat worn by President Morsi when he received an honorary doctorate from a university in Pakistan in early March. The prosecutor-general ordered Youssef’s arrest on Saturday after a number of complaints were made against him for allegedly insulting President Mohamed Morsi, denigrating Islam and spreading false news with the aim of disrupting public order. During a phone interview with popular TV anchor Lamees El-Hadidy on Saturday night, Bassem Youssef rejected the accusation that he had insulted Islam. TV satirist Bassem Youssef also complained that he was not officially summoned for questioning before he received an arrest warrant on Saturday and that this is against legal procedures. “I was never called for a hearing before [the arrest warrant] was issued, which is the legal norm, and we were surprised to hear the news via the media,” Youssef said via Facebook on Saturday, adding that he would go to the prosecutor-general’s office on Sunday at 9:30am. Youssef hosts weekly satire show El-Bernameg (The Show) on private satellite channel CBC. The complaints were filed by 12 people after Youssef’s 1 March episode in which he mocked the president’s interview with TV anchor Amr El-Leithy in February. In January, a number of Islamist lawyers filed a separate lawsuit against Youssef for “undermining the standing of the president” during his show but the charges were dropped before the case reached court. Youssef said he would make himself available to the office of the prosecutor-general on Sunday. Dozens of supporters of Bassem Youssef rallied outside the office of the prosecutor-general in solidarity with the renowned satirist.